(Kansas City, Mo. 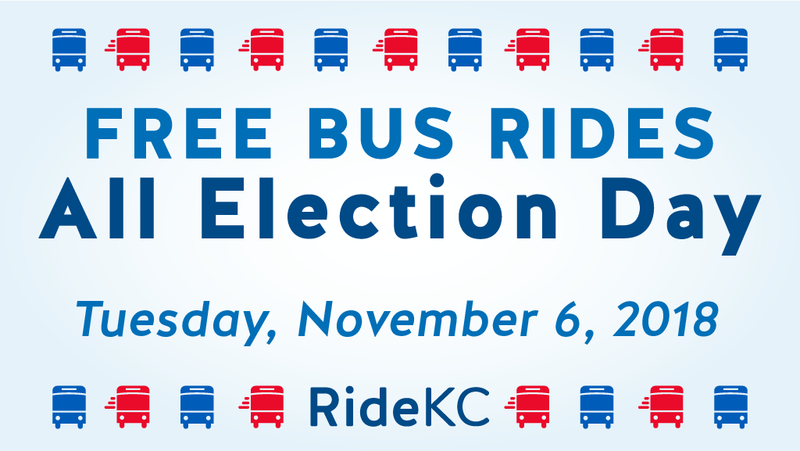 – Oct. 8, 2018) RideKC routes will offer free fares all day on Nov. 6 to make it easier for citizens to vote. Download a Resource Guide for help voting and riding. On Election Day, fares on all RideKC bus routes serving Kansas City, Johnson County, Wyandotte County and Independence will be free. KCATA, Johnson County and Independence paratransit will also be free to ride. The deadline to register to vote is fast approaching. People in Missouri need to register or update their voter registration by Wednesday, Oct. 10. The deadline for Kansas is Oct. 16. To find your polling place and check your voter status, Kansas City residents in Jackson County can visit the Kansas City Election Board website, http://www.kceb.org/. For other locations in Missouri, start with the Secretary of State’s website, https://s1.sos.mo.gov/elections/voterlookup/. In Kansas, Johnson County voters can access resources at Johnson County Election Office, https://www.jocoelection.org/default.htm, and Wyandotte County election information is available at Wyandotte County Election Office, http://www.wycokck.org/election/. The above websites can provide more details. For those who live elsewhere in Kansas, information is available at Vote Kansas, http://www.voteks.org/. Customers can plan their travel early. For help planning your trip, call 816-221-0660 and be ready to provide the starting address and the address of the polling place you will be traveling to. Customers can also plan a trip with Google Transit trip planner, available on the home page of RideKC.org. The Regional Call Center is also open weekdays from 6 a.m. to 7 p.m.